Forced to move back home to the Blue Ridge Mountains of Virginia after her father and brother end up in jail for running a Ponzi scheme, Sophie Parker does the best she can. While living with her curmudgeonly aunt, she works as a wench waitress at a pirate-themed restaurant and learns the ins and outs of discount shopping through a coupon group. Life goes from bad to worse when an innocent airplane ride with her former teenage crush, AJ, leads to her being picked up by the police. The plane’s indebted owner has been murdered, and he’s the man who helped put her father in jail. What started as a curiosity has now turned into a quest to make sure she isn’t arrested. Armed with gossip from the women in her coupon group, and her cantankerous aunt, Sophie sets out to find out who killed the ruthless businessman minutes after she flew off with AJ. The first in the Sophie Parker Coupon Mystery series. 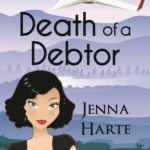 Jenna Harte loves to write about crime and passion. She is the author of the Valentine Mysteries, the first of which, Deadly Valentine, reached the quarter-finals in Amazon’s Breakthrough Novel Award in 2013. She also has a three-book romance series, Southern Heat, is currently working on a traditional cozy mystery featuring a fairy tale loving, coupon clipping sleuth. When she’s not telling stories, she works by day as a freelance writer, blogger and online entrepreneur.